The best theme park dark rides take guests on journeys to fantastic places and engage them in adventures that embrace their imaginations and senses of wonder. Harry Potter and the Forbidden Journey, the signature attraction at The Wizarding World of Harry Potter- Hogsmeade in both Islands of Adventure at Universal Orlando and Universal Studios Hollywood (as well as at Universal Studios Japan) is the best of its kind. It exploits technology in new and startling ways, while keeping the "how'd-they-do-that?" magic seamless. It transports muggles into the fanciful realm of J.K. Rowling's books and the movies they inspired. Forbidden Journey is a stunning achievement and a must-see attraction. Thrill Scale (0=Wimpy!, 10=Yikes! ): 5.5. There are lots of dark rides "gotchas" and psychological thrills. This is an aggressive ride that simulates flying with sometimes startling vehicle movements. Note that some sensitive passengers experience motion sickness. Attraction Type: Dark ride with vehicles mounted on robotic arms. Note that the vehicles may not accommodate heavier guests with certain body types. Test seats are available prior to boarding. Stow all loose items in the free lockers. Consider the single-rider line when the queue is long. Front-of-the-line passes are accepted in both Hollywood and Orlando. Forbidden Journey is one of the 12 Best Rides at Universal Orlando and one of the 10 best rides at Universal Studios Hollywood. Rounding the bend at the end of The Wizarding World's impeccably detailed Hogsmeade village, the sight of Hogwarts Castle punctures the sky and stirs the senses. The mythic building, which had previously only existed in the minds of adoring readers and on screen as part of the film series, looks picture-perfect in person. To board Forbidden Journey, guests pass through its gates and into the majestic castle. Ambling through Hogwarts is, in itself, an immersive attraction. Nestled throughout the queue are artifacts from Rowling's world that will delight ardent fans. Hey! There's the Mirror of Erised. And look! We're entering Professor Sprout's Herbology gardens. In California, there are stunning views of the Hollywood hills to add to the ambiance. The Potter-clueless, however, need not worry. If you don't know a Whomping Willow from a weeping willow, you'll still be charmed by the discoveries at every turn. 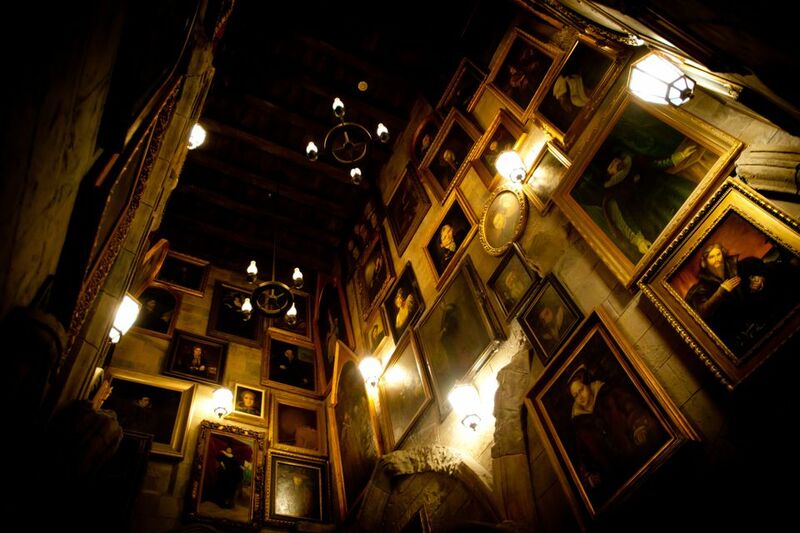 And when you enter the castle's portrait gallery and discover the paintings come to life, you'll be captivated by the talking characters, even if you don't have a clue what they're saying. The seamless theme park magic we referred to earlier is abundant in the gallery. Of course, oil paintings can't really come to life; yet, the effect is so well done, guests can't help but go along for the ride. Going along for the ride is the whole point of Forbidden Journey. Professor Dumbledore, Hogwarts' headmaster, has opened the school to the outside world for the first time and has invited muggles (non-wizards) to learn about its history. Guests enter his office, and the professor (actor Michael Gambon) welcomes them. Dumbledore's ultra-high-resolution, high-frame-rate projected image (a trick that attraction conjurers have used before) is somewhat realistic, if a bit ethereal. The headmaster sends his visitors along to the Defense Against the Dark Arts classroom for what he promises will be a rapturous lecture. However, Harry, Hermione, and Ron doff their cloak of invisibility in the classroom to warn the visitors about the boring lecture that awaits them. If the line gets slowed or stopped in either Dumbledore's office or the classroom, as sometimes happens, guests held in those areas may be subjected to more than one repetition of the actors' spiels. It's a slightly incongruous note in an otherwise enchanted pre-ride experience. The Hogwarts kids hatch a plan to save guests from the tedious talk by inviting them along for an extracurricular adventure. The means of egress are "enchanted benches" and the Floo Network (a kind of magical transportation system in Harryland). So, it's off to the Sorting Hat to get boarding instructions for the not-all-that-forbidden journey. The vehicles seat four riders and are on an Omnimover-style, constantly-moving track. Over-the-shoulder restraints hold guests snugly in place—a necessity given the wild ride that ensues. While it is hidden from view in the loading area, each vehicle is attached to a robotic arm. A dark ride first (and given the incredible success of Forbidden Journey, probably not a dark ride last), the advanced robotics enable the vehicles to pivot, swoop, and otherwise move with an astonishing degree of flexibility heretofore unavailable to attraction designers. After Hermione sprinkles the benches with Floo powder, they magically rise, and guests are flying—and I mean flying—alongside Harry and his pals. The ride alternates between filmed sequences projected onto mini domed screens and actual sets adorned with all kinds of mechanical dark ride "gotchas." The scare tactic of elements jumping out at vehicles is as old as the classic Pretzel dark rides that used to wreak havoc at places like Coney Island in the early 20th century. But the high-tech wizardry Universal employs, particularly the fluid, sudden, every-which-way movements of the robot-driven vehicles, gives Forbidden Journey a decidedly 21st-century spin. A note of warning: Universal isn't kidding about stowing loose articles in the free lockers. The ride is not intense in a roller-coaster kind of way. But we did lose items from our pockets as the bench moved us into a prone position and shook us down. You would too, if you have anything in your pockets. The vehicles' freedom of movement combined with the enveloping screens gives a 'you-are-there', dimensional quality. Among the many design mysteries that had me scratching my head was the fact that the vehicles are constantly moving forward on a track through the ride building, yet the screens remain fixed in front of the benches for at least 20 seconds at a time for each of the filmed sequences. Each ride vehicle has its own mini domed screen that follows it for the duration of each sequence and the vehicle and screen follow a circular path for each scene. Considering the number of vehicles in the high-capacity ride, that's a lot of screens. And a testament to the ingenuity and level of attention lavished on Forbidden Journey. In the original Forbidden Journey at Orlando's Islands of Adventure, the filmed sequences are not rendered or presented in 3D. At Universal Studios Hollywood, however, they were originally shown in 3D. There, passengers were given "Quidditch goggles" prior to their journey. The added depth and intimacy made the experience more immersive. To accommodate the 3D, Universal Creative re-rendered the ride's footage. They also made it noticeably brighter and a bit sharper. The colors appeared to be somewhat more saturated in the Hollywood version, which was a bit distracting. Because some passengers were reportedly experiencing motion sickness, the Hollywood park removed the 3D and reverted to a 2D version of the media. However, both Orlando and Hollywood now present the media in higher resolution. While it is still 2D, it is noticeably brighter and sharper (although not as bright or sharp as media that is created natively in high resolution). As with many park rides, the story is a bit muddled. Amid all of the chaos, it's hard to follow the narrative. No matter. The encompassing attraction sends riders into its trippy, fever-dream world where things don't necessarily make sense, yet feel astonishingly real. The story has something to do with gaining a glimpse into the often-harrowing life of the boy wizard. By traveling through the Forbidden Forest (beware the Whomping Willow! ), into a Quidditch match, and to other places featured in the popular series, the attraction plays like a Harry Potter highlight reel. Although we were merely passive guests in the very active ride, we were nonetheless welcomed back as heroes by the Hogwarts gang at the end of the journey. We can't say that we felt like heroes. (Especially when Universal tried to shake us down for a cardboard-framed picture of our enchanted-bench posse in the inevitable post-ride march through the gift shop.) But we can say that we felt like we had been taken to a truly magical place. For a few glorious moments, the Floo Network, flying benches, and willows that whomp seemed not just possible, but actual. The Forbidden Journey provides a new intersection for park attractions where magic and logic, virtual and reality, and wizards and muggles meet.